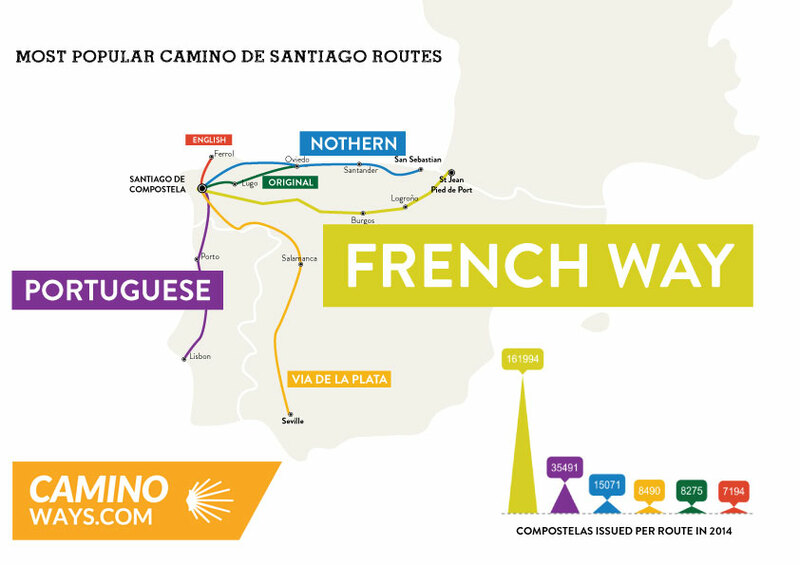 1-The most popular Camino de Santiago route is still the Camino Frances or French Way with 68.10% of all Compostelas issued (161.994 people) in 2014. 2-The classic Camino Portugues is the second most popular with 14.92% of all pilgrims, 35.491. 6-and the English Way or Camino Ingles attracted 3.02% of pilgrims (7.194). Still not at the top but one of the routes experiencing the biggest growth. The Camino Ingles received 1.86% of all pilgrims reaching Santiago in 2013. It is worth noting that statistics only account for those pilgrims who have received the Compostela, hence finishing in Santiago and therefore not taking into consideration those pilgrims walking stretches of the Camino de Santiago routes in France, Spain or Portugal for instance but not reaching Santiago. 1-Sarria on the Camino Frances remains the most popular Camino starting point with 58.554 (24.61%) pilgrims starting their journey here in 2014. 2-Saint Jean Pied de Port, starting point of the Camino Frances, was chosen by 29.344 Camino pilgrims or 12.34% of the total. 3-Tui (Camino Portugues) was the starting point for 11.575 (4.87%) pilgrims. 4-León was chosen by 11.410 (4.80%) pilgrims. 5-Porto (Camino Portugues and Portuguese Coastal Way) was the starting point for 10.636 (4.47%). 6-10.260 or 4.31% of the total started their Camino journey from O Cebreiro. 7-Ponferrada was the starting point for 7.979 (3.35%) pilgrims. 8-7.848 (3.30%) chose to start their Camino walk from Roncesvalles. 9-Ferrol, starting point of the Camino Ingles – English Way, saw 6.817 (2.87%) pilgrims commence their journey there last year. 10-Astorga saw 5.810 (2.44%) pilgrims starting their Camino journey. Hi Barb, we organise that as part of our packages. Let us know if you need any info. How us luggage transported from one place to the other? Is there a service that does this?